After Rio I went up along the coast to Salvador, the capital of Bahia. 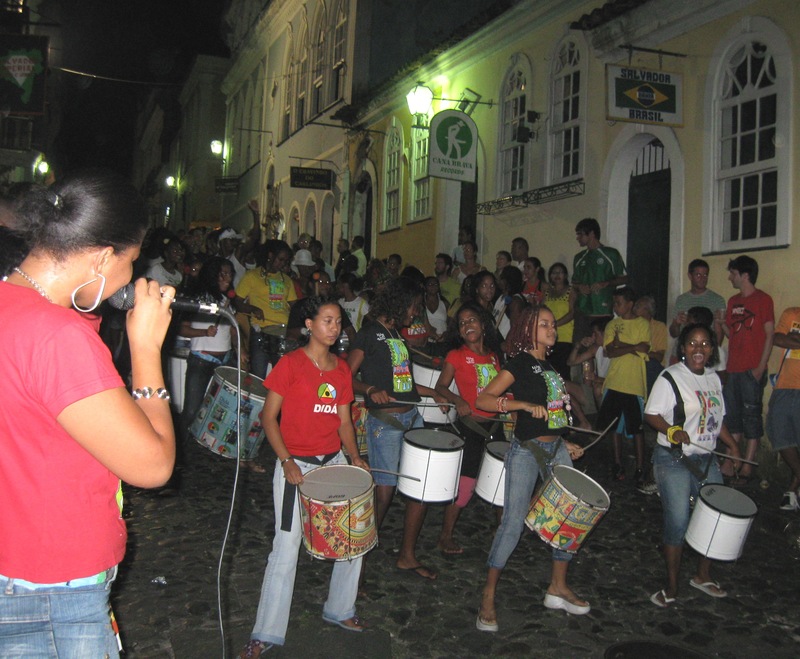 This is where the famous olodun drums and heart-pounding, throbbing music of Brazil comes from. 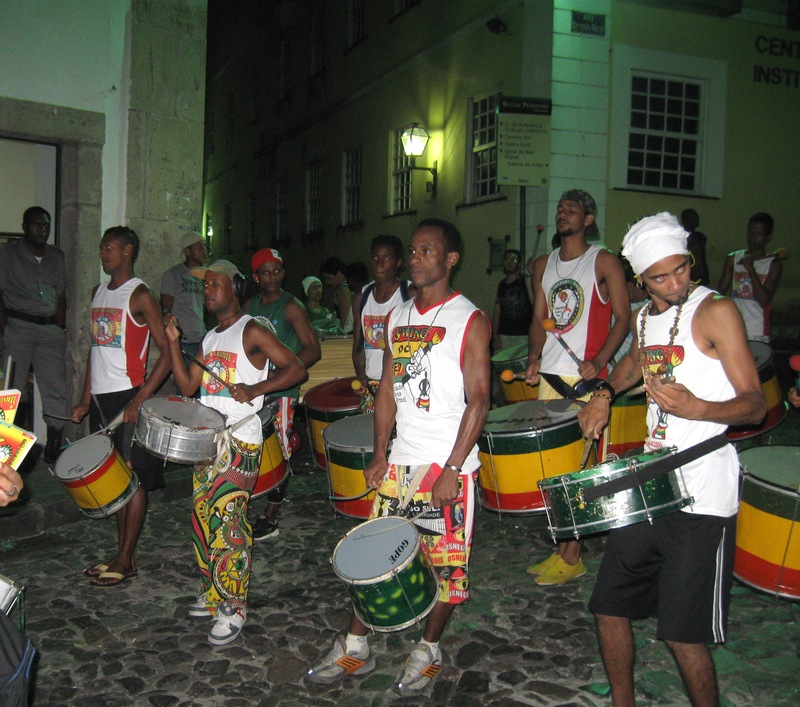 Although different parts of Brazil each have their own kind of music, Salvador is arguably the musical capital of Brazil. And it is everywhere – at street corners, in cafes, in bars. And the heart of it is In Pelhorinho, the old city of Salvador. Large plazas are bordered by old cobble-stoned streets that wind up and down steep hillsides. 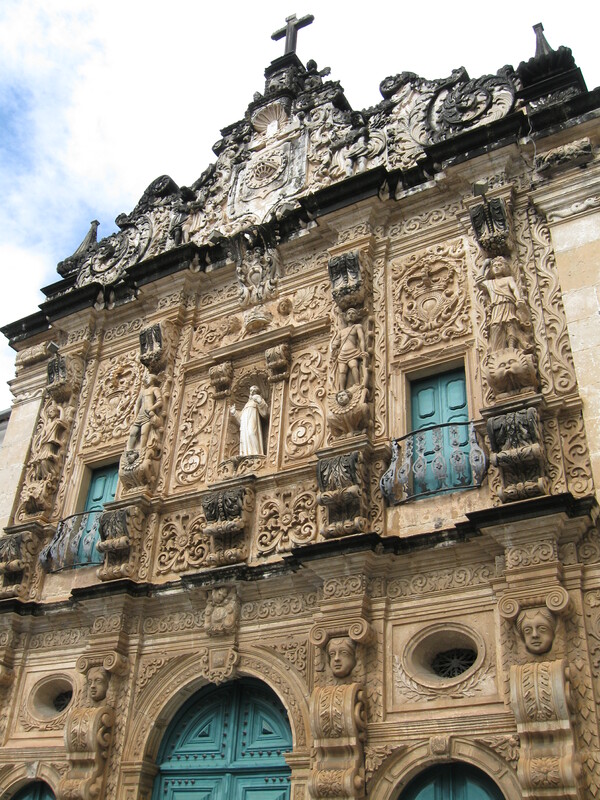 The streets are lined with old mansions with fanciful carvings and wrought iron balconies. All are old, many built more than a couple of hundred years ago. And around every corner it is seems there is a church. They are as numerous as Starbucks in any large city. In the glory days of Pelhorinho the well-to-do had these churches built. Each wealthy family vied with the next and the ornate decorations of the churches bear testimony to their rivalry. This is the area that most of the tourists flock to during the day. To see the sights, to sit in cafes and watch the world go by, to dip into the little stores that line the streets, selling all the usual tacky souvenirs. And if you look hard enough, once in a while you can find a gem. But this is also an area that is deemed unsafe at night. Apart from the area near the main plaza, most of the streets are deserted after sundown and wandering around down alleyways is simply asking for trouble. Those on the streets are usually unsavory characters – a sibilant ‘psst’ usually precedes someone asking how much marijuana you want to buy. If that doesn’t catch your fancy, there are other harder drugs for sale as well. 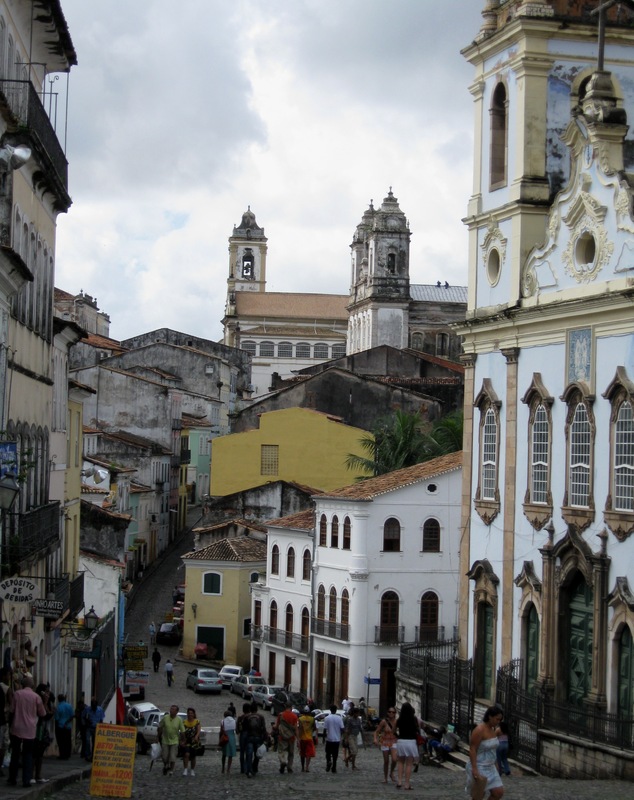 Many of the residents of this part of Salvador are poor, living in favellas and addicted to crack or cocaine or worse, and begging is the norm. Despite the tourist police (who are frequently corrupt), parts of Pelhorinho are unsafe during the day and definitely during the night. I have met more than one traveler who has been mugged at knife or gun-point. And they were in a group when that happened. But all is different on Tuesday nights. On Tuesday nights the local bands come out and play on the streets. Bands start at some corner and begin to play, the music interspersed with aerobic leaps and jumps, throwing up the huge drums and catching them on their way down, all of it without missing a beat. They play in one spot as a crowd gathered and soon the crowd begins to dance as well. The band moves and the dancing crowd follows behind them. As they play and snake their way up and down the steep cobble-stoned streets they gather a larger and larger crowd of followers at each step. On and on goes this long line of revelers, easily several blocks long. It reminded me of that old Grimms’ fairy tale of the Pied Piper of Hamlin. The deafening music reverberates in one’s stomach and echoed off the walls of the buildings. Feet that cannot stop moving and bodies that cannot stop twitching to the beat. Dancing to the beat, dripping with sweat the crowd kept moving in the trail of the bands. The sheer vibrancy takes one’s breath away! 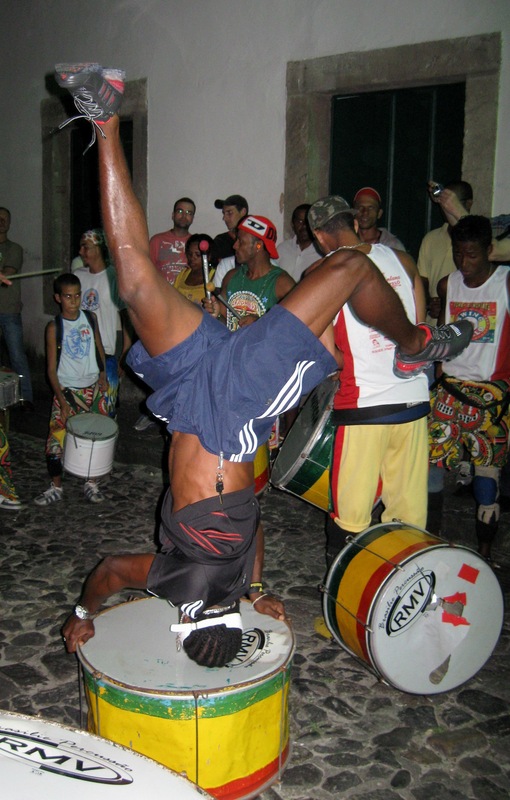 This is no samba of the danceclubs in Rio, nor is it salsa or capoeira. This is freestyle street dancing. The volume of the music is deafening, the energy level unbelievable and the enthusiasm of the crowd astounding. Swept along with the crowd, we danced following the band, up one street and down the other and around the square until we were out of breath and forced to stop. But that was only for a while – just to rest, buy something to drink, take a breather and then move on again. Vendors carting styrofoam boxes wove their way through the crowd doing brisk business selling cold water and soft drinks. The human chain of dancers followed the bands for hours and it was only late in the evening that it slowly petered out. The last band stopped, people trickled back to their houses, tourists to their hotels and padlocks clicked shut on doors. Shutters came down on store fronts and Pelhorino was quiet again. But only for a week until the next Tuesday when the music begins again.